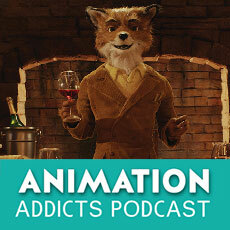 This episode of the Animation Addicts Podcast, we review Wes Anderson’s first foray into animation Fantastic Mr. Fox. Critically acclaimed; however, the box-office results are another story. Wes Anderson’s first animated film. Why did he choose this specific Roald Dahl book? Authentic production design and a “primitive” stop-motion animation style adds charm. Why the “cuss”? – Do you think it’ll catch on? The wolf – what does it represent? Don’t forget to use the hashtags #AnimAddicts and #AnimAddicts103 when talking about this episode on Twitter!